There are different brands out there and many different flavors to choose from! (vanilla, cinnamon, toffee, cocoa bean etc) I purchased mine at the local health food store but you can get them almost anywhere now. Try Amazon if you can’t find them locally. Here are my favorite ways to use them! I am not a fan of them in my hot drinks for some reason but I love them for my unsweetened tea or iced coffee! Gives just the kick I need! In general, my smoothies are sweet enough thanks to the fruit or protein powder, but there are times when I use plain greek yogurt and it needs just a kick of sweetness. I also have plain greek yogurt and sliced fruit as a snack often and if the fruit isn’t ripe enough I add a few drops! It also changes the flavor a bit too! One way I get around your usual cereal is by making a protein powder “cereal”. 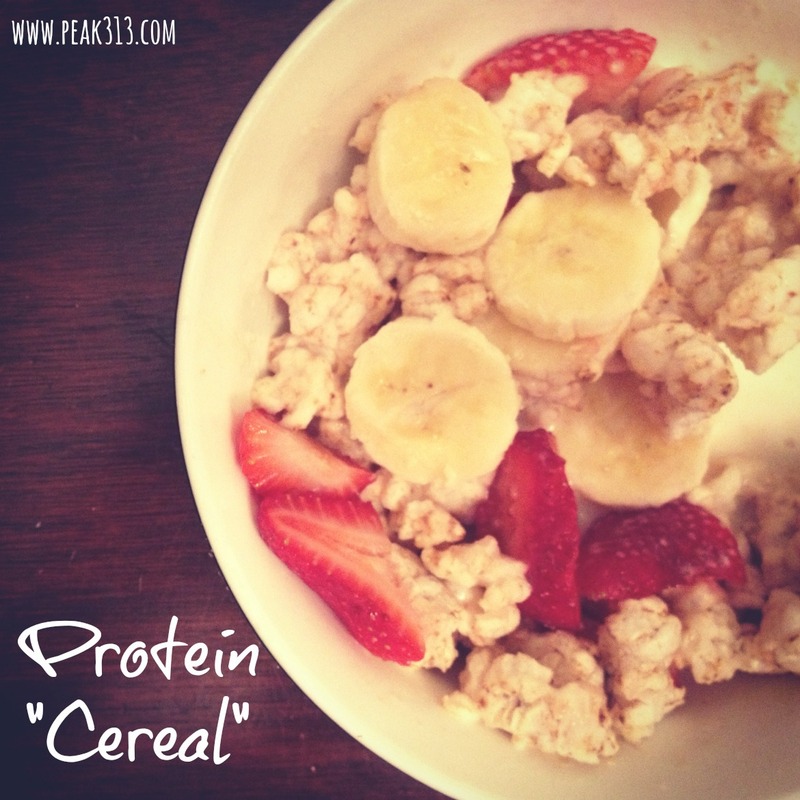 Mix the protein powder and milk together in a bowl. Crumble the rice cakes over top of it. Top with fruit and a few drops of stevia! Mix together and eat! 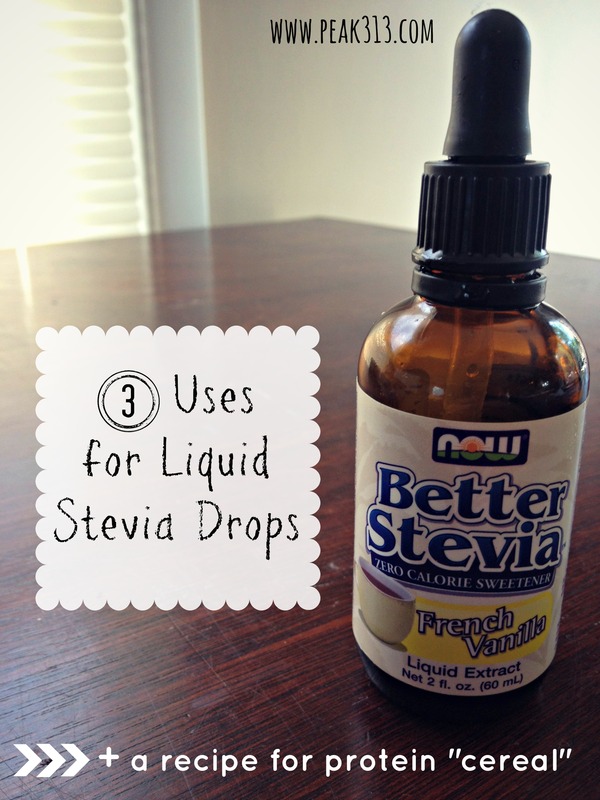 Do you use flavored liquid stevia drops? Which flavor and brand? What do you like to do with them? I would never have thought to use rice cakes as cereal. Now I will definitely have to try that out with my almond milk. Thanks, Clare! I use KAL Pure Stevia. It is a powder. I did NOT like Stevia at all until I tried this brand. It is a little pricey, but you only use the tiniest amount. I even like it in my coffee… in fact, I now prefer it in my coffee! Check it out! They sell it on amazon and in some health food stores. It’s AMAZING!!! How many drops do you use in tea or iced coffee? Cool idea! I never thought of rice cakes for a “cereal”! I don’t use protein powder but have been wondering about it as I wanted to up my percentage of protein…and as I don’t care much for meat, this sounded like an option for me. Thanks for the article! Do you have a brand of protein powder you recommend?